The TC15 rechargeable LED flashlight adopts the latest CREE XHP35 LED to make output up to 2,300 lumens and max beam distance of 246 meters. The high output, compact size, micro-USB convenient charging, and long runtime can meet all your illumination needs for for everyday carry, travel, key-chain, car, camping, fishing, household, EDC and general use. EXTREME OUTPUT: Powered by a CREE XHP35 LED, the TC15 produces up to 2,300 lumens with a beam distance of 807 ft / 246 m.
MODES FOR EVERY SITUATION: Firefly/ Low / Medium/ High / Turbo /Strobe light modes makes the TC15 perfect for any situation. COMPACT AND LIGHTWEIGHT: 4 oz / 113 grams and 4.8 inch / 12.19 cm long, the TC15 packs a serious punch while still being compact enough for backpacks, pockets and belts. USER FRIENDLY UI AND RUGGED DESIGN: Access Turbo from any mode with a double-click. Grippy and non-slip knurling design makes the TC15 glove-friendly. *Please note: Due to heat generated, the TC15 will step down from 2300 to 820 lumens in 2 minutes. Holster x1, Spare O-ring x2, Lanyard x1, Pocket Clip x1, ThruNite 3100mAh 18650 IMR Battery x1, USB Charging Cable x1, Spare USB Rubber Cover x1, Spare Side Switch Cap x1. Press the side switch to turn the light on/off. With the light off, press and hold the side switch to get firefly mode. With the light turns on, press and hold the side switch to circle through Low, Medium and High mode. Double click to turn to turbo from any mode. Another double click to get to Strobe. The light will automatically lower the current when temperature in LED or driver rises to 80 degrees centigrade to protect the flashlight from overheating. Thus to extend its lifespan. screw the tail on and tighten it all the way to operate the light. 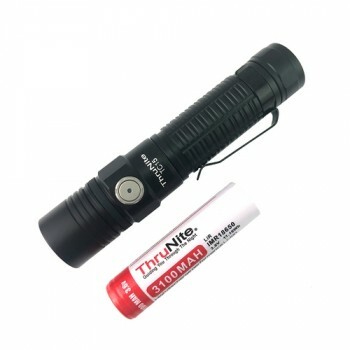 We suggest to charge the battery in the TC15 light. During charging, the indicator is RED; After being fully charged, the indicator will be BLUE; When indicator flashes purple, it means abnormal charging. Only firefly and low mode is available duing charging. Battery capacity: >20%, Blue light will be ON. Battery capacity: 10%-20%, Red light will be ON. Battery capacity: <10%, Red light will flash and remind to charge the battery immediately. After being fully charged, Blue light will be ON. Note: the battery capacity indicator will not work at Firefly mode, or when the battery capacity is 0%. COPYRIGHT © 2019 ILLUMINATION SUPPLY LLC. ALL RIGHTS RESERVED.